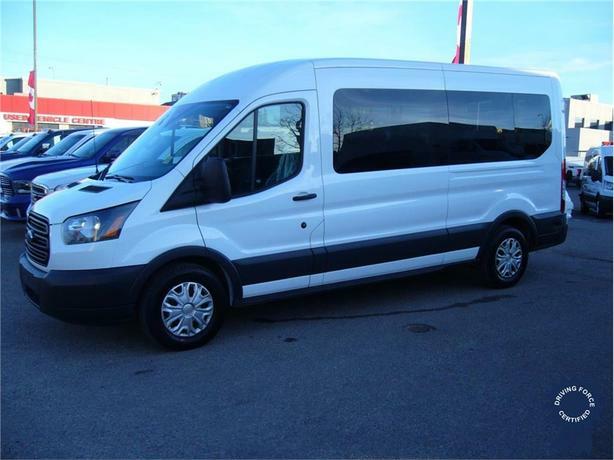 This 2016 Ford Transit T-350 XL Medium Roof 15 Passenger Van comes with a 148-inch wheelbase, 6-speed automatic transmission with over-drive and SelectShift, rear-wheel drive, 3.31 limited slip axle ratio, passenger-side sliding door for easy entry, 16-inch steel wheels with full silver covers, cloth charcoal color seats, heavy-duty trailer tow package, 150-amp alternator, trailering wiring provisions, trailer brake controller, power mirrors with long arm, rear window defogger, privacy glass, AM/FM stereo with 8 speakers, 4-inch multi-function display and message centre, leather-wrapped steering wheel, controls for audio and multifunction display, SYNC Communications and Entertainment System, 911 Assist, SYNC Services, AppLink, Bluetooth, steering wheel controls, USB port and auxiliary input jack, keyless entry pad, cruise control, reverse sensing system, backup alarm, backup camera with zoom capability, Bluetooth hands-free calling, manual air-conditioning, rear heat and air-conditioning, remote keyless entry, power door locks with autolock feature, three 12V DC power outlets, vinyl/rubber floor trim, low tire pressure warning system, block heater, hydraulic power-assist steering, Alberta CVIP Commercial Bus Inspected, 2,800 lbs Maximum Payload, and GWVR rating of 9,150 lbs (4,159 kgs). The 3.5-litre Ecoboost V6 gas engine provides 310 horsepower at 5,500 RPM and 400 lb-ft of torque at 2,250 RPM. Touch base with us to discuss purchasing or financing options that are right for you and experience the difference you will only find at DRIVING FORCE Vehicle Rentals, Sales and Leasing.